Yes, your account has been overloading which causes the server to respond slow. You can view your CPU logs from CPanel->CPU Stats. how can I make tmy account to stop overloading and make it to have a normal load? Yes, this is true, but your account is indeed overloading now and yes it used to overload before too but we didn’t care about it since nobody was complaining and now everybody is complaining and all overloaders must either upgrade or reduce the load to the package limits in order to continue hosting with us. This entry was posted on Monday, February 4th, 2013 at 3:12 am and is filed under Uncategorized. You can follow any responses to this entry through the RSS 2.0 feed. You can leave a response, or trackback from your own site. Start a new comic: that is an interesting idea. New characters, settings, stories, art style, etc and on a new website. See where it takes you. But maybe as a side project. Stop Pilli: No. No no no. Pilli is still great and still has lots of potential. Pilli can go on longer and has plot elements/characters that could be explored further. If you were to create a new website uploading Pilli content would be the same as uploading a new story (still images with text) so you could just bring Pilli over. And if you do create a new website be sure to upload all the old Pilli strips and any comments/creator commentary that were really good. Ni idea de que recomendar a estas alturas… Pero pienso que seria tal vez mejor el crear un nuevo sitio desde cero, te da oportunidad de manejar todo tipo de cambio o anomalia segun yo, no lo se, yo no tengo sitio propio asi que me es dificil opinar. Moving to a new server might be helpful, but I think only start a new comic if you are really done with Pilli yourself. I think you have told some great stories and done a good job with it. But I also know that if you do what the crowd wants, and not what is in your heart, you’ll never be happy and the comic will suffer, then there will be no more fans anyway. So you gotta do what will make you happy. Also, Loving this new Mona arc very well done. No Ive plans for Pilli the ending I want to do at least 2 more 150 pages book to do a proper ending, then start a new comic and once in a while do some Pilli one shots. Good idea, other webcomics have done this. Shortpacked is a continuation of Its Walky and characters from that series pop in every once in a while. 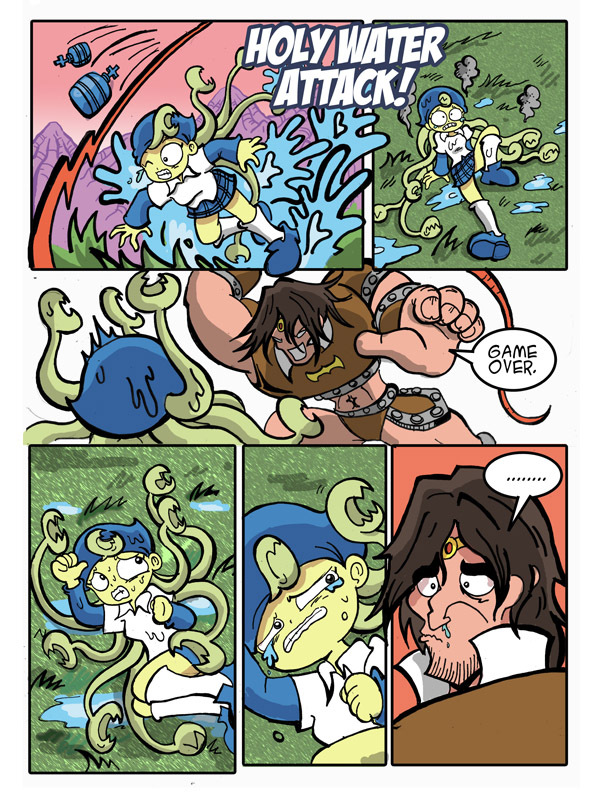 And Sluggy Freelancer is still going strong with its 10 year long final massive arc. Have you seen the work of Dylan Meconis? http://www.bitemecomic.com/ All of his/her stories are fixed length rather than going on and on forever. But they come to a satisfying conclusion. @khamya only heard not seen…………..everyone is happy that Pilli will end someday…………..depresion….